Twitter, the ever-bustling “bar-scene” of the social media platforms. The OG channel to drop witty one-liners, let loose, gab with strangers, just *maybe* get a reply from a celebrity. People from every walk of life flock to chatter about everything and anything relevant. This uniquely level playing field is precisely what draws companies to dive in and engage with their customers. It’s prime real estate to showcase your brand’s personality, be accessible ’round-the-clock, and keep your finger on the pulse of customer feedback. Craft targeted, eye-catching content and watch the retweets roll in. Easier said than done, of course, but there are a few commonalities among brands with killer engagement. Developing a strong social video strategy is one of the most effective ways to bolster engagement. If a picture is worth a thousand words, a video’s worth infinitely more in the Twittersphere today. Twitter analyzed 3.7 million accounts and found that Tweets with video attracted 10x more engagement over Tweets without video. That’s not insignificant. If you’re looking to make your message more memorable, optimizing replay-worthy videos for peak engagement should be topping your content priority list. You should recognize your audience’s viewing habits and that 85 percent of social videos are watched with the sound off. The importance of adding captions to video on Twitter can’t be underscored enough. Unfortunately, Twitter doesn’t currently offer a feature that allows closed captions, so you instead must encode or “burn” captions into the video itself. Fortunately, we’re here to walk you through how to easily add captions to your Twitter videos using Rev’s services. Important note: Twitter limits your video length to 2 minutes and 20 seconds and only MOV and MP4 files. Both “captions” and “subtitles” crawl across the bottom of your screen with text, and typically represent speech between characters. But while captions are a transcription of dialogue, subtitles are a translation. Unlike closed captions, subtitles assume viewers can hear and are typically used when the viewer doesn’t speak the language used by the speakers in a video. Closed captions, known explicitly by the symbol [CC], can simply be toggled on or off, as desired. The power is in the viewer’s hands. Open captions, contrastingly (also called burned-in or hard-coded captions), are permanently fixed to the video. The “virtual Sharpie” of captions, if you will. Since Twitter doesn’t (yet) offer a feature that lets you upload a separate sidecar file on their platform, we’ll detail how to add these guys to your videos below. Native video is content uploaded directly to a social platform and played in the newsfeed stream, as opposed to videos hosted on third party sites like Vimeo, for example. Say you’ve already created killer video content and uploaded it to another platform, like Youtube or Vimeo. You’re likely wondering why you can’t just tweet a video link and call it a day. That would certainly be easier than uploading natively and adding twitter captions separately. While you technically can, a natively uploaded video has a major advantage over third-party embeds. Like search engines, social media platforms have their own algorithms that highlight the best results for a search. Since Twitter favors native over embedded video content, it’s your best chance at maximizing views. One study found that native content reaches two times more people. It’s a no-brainer if your goal is to get more engagement on your posts. If you’re struggling to justify the extra time and money investment of adding captions to Twitter videos, hang with us here. For starters, you’ll increase view time by more than 12 percent. People will watch your videos for an extended amount of time as they follow along with the written text. Below are a few other reasons to start captioning your Twitter videos. One of the most important reasons why companies add captions to videos is to assist those who are deaf or hard of hearing. Video captions are the only way that those individuals can access and understand your videos fully. The World Health Organization states that more than 466 million people in the world have disabling hearing loss. Investing in video captions to reach that sizable audience is well worth an added $1 per minute of video. Chances are you’ll be publishing your Twitter video on other platforms, like YouTube, Facebook and LinkedIn. And while Google can’t read burnt-in captions on your Twitter videos, it can certainly read those closed captions elsewhere. 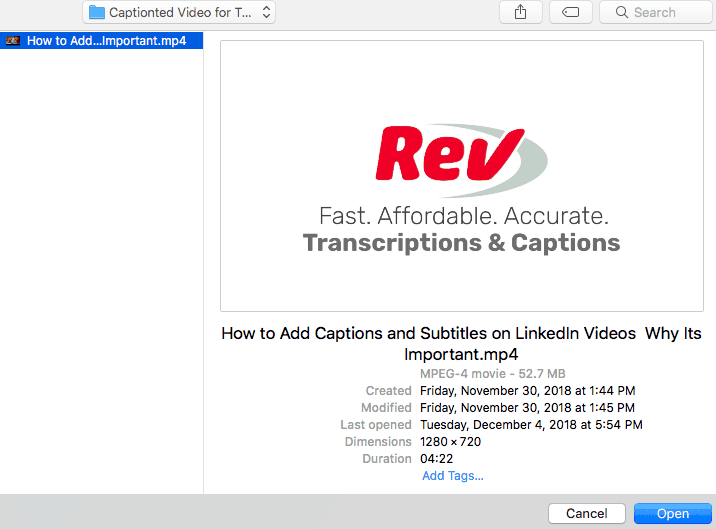 Rev also provides a complimentary transcript when you order your captions file, and we’d highly recommend publishing this under videos on YouTube and Vimeo–or even linking to it on your website. When you add closed captions and transcripts, you signal to Google that you have valuable information to share. Otherwise, it has no text to crawl and index in search. Just like alt tags are critical for images, captions and transcripts are critical for videos. Adding them ensures they’ll get properly crawled and will show up when people search for a question that your video answers. Neglecting to add captions and transcripts means that your video likely won’t even show up in search, and that’s just a shame. When your audience shares your video, they might want to pull a quote from your video. Maybe they want to include it in an email. Or perhaps there’s a perfect little soundbite to grab and post as a social card on Instagram. Rather than making your viewers tap the rewind button twelve times to ensure the quote is accurate, adding captions makes it exponentially simpler for them. You’ll also see more people commenting on videos with subtitles, and your audience is more likely to reach out with follow-up questions or interest, if you’ve taken time to caption your video content. Along with Facebook and Instagram, Twitter auto-plays videos without sound. As we mentioned earlier, 85 percent of social media users scroll through their newsfeed with the sound turned off. This means that if you don’t have video captions, a lot of people are skipping over your video simply because the meaning is lost without sound. The goal should be to make your videos “volume agnostic,” providing value to users opting in or out of audio. Burning captions into your Twitter video means you’ll be drawing in more people to view your content, regardless of their viewing preferences. Now that you’re well-versed in the benefits, we’ll explain how to add captions to video, below. 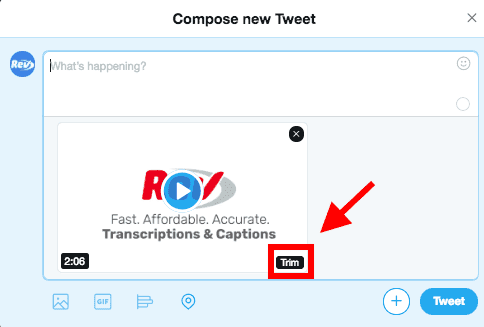 If you upload the video you want to post on Twitter to Rev, we’ll return a captions file (along with a complimentary transcript) within 24 hours. The cost is only $1.00 per minute. Since Twitter videos are only 2 minutes and 20 seconds long max, this process should be easy on your wallet. 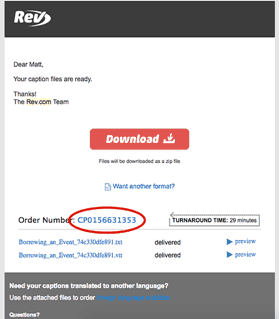 We guarantee 99% accuracy in our captions and transcripts, but give everyone the opportunity to personalize their captions. Our intuitive captions editor will let you make changes to the video captions in real-time. The transcript and included timestamps will make editing a speedy process. This is where things get a tad bit technical. Using Adobe Premiere Pro, you can follow these instructions to add your captions file to your video. It’s important to set them as forced open captions. Doing this burns your captions into the video, meaning that anyone viewing your video will see the captions automatically. Now that you’ve burned in your captions, it’s time to upload your accessible video content to Twitter. It’s fairly simple. Open your Twitter profile, click the Tweet button at the top right. Click on the icon at the bottom left of the Tweet window, which says “add photos and video” when you hover over it, and select your open-captioned video file. Next, click “open” double click the video file you want to upload. If your video is longer than 2 minutes and 20 seconds, click “trim” in the bottom right corner of the uploaded video. Simply slide the trim bar to the parts of the video you want to use and adjust the length by grabbing the darker blue sliders on either end of the trimmer. Side note: if your video is too long, and there’s no natural place to end the clip, it might make more sense to edit it down in Adobe Premiere Pro. Finally, you’re ready to add an attention-grabbing caption that draws your audience in. Keep it concise, true to your brand voice, and optimized with hashtags to maximize engagement. We’re crossing our fingers that Twitter will (hopefully, soon) join its social media pals, Facebook and LinkedIn in adding a convenient on-platform captioning feature. From increased accessibility to improved SEO and content discovery, Twitter users that opt-in to captioning their videos are seeing benefits across the board. Other than captioning your Twitter videos, what are your favorite ways to optimize video content on the platform? Comment your tips in the section below.